On Saturday, January 27th, the Landmark Academy in Commerce City, CO once again opened its doors to the Landmark Comic Book Club Mini Con. This was the club's second annual mini-convention and several local Colorado creators came out to help them celebrate. 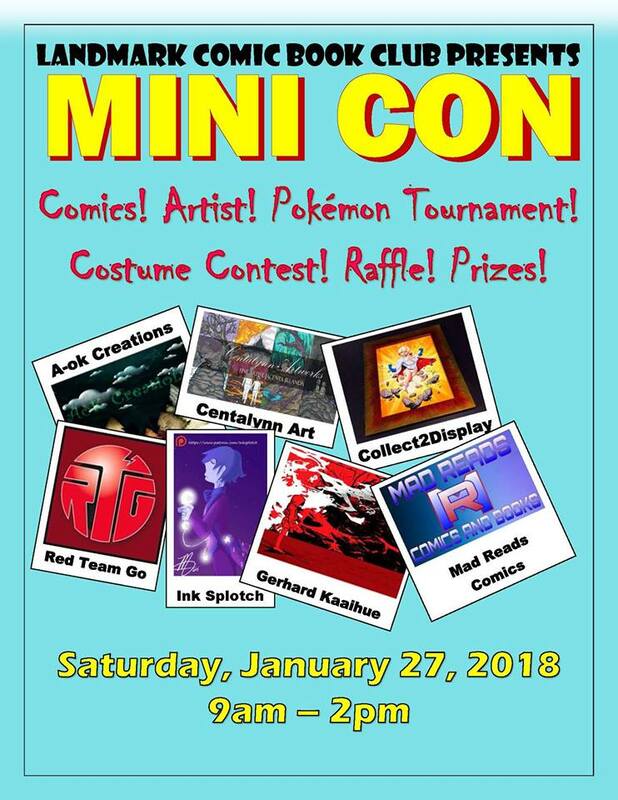 Belying the "Mini" in their name the day-long event featured several panels, a Pokemon tournament, a Kid's Cosplay Contest, and a full table of prizes to be raffled away through the afternoon. Offered below is a gallery featuring some of the creators that were set up and selling their wares at the show. The Landmark Academy at Reunion - in Commerce City Colorado hosted the Mini-Con. Almost immediately inside the front door, I found Patricia Krmpotich and Dan Conner with the full spread of their My Gal the Zombie comics. To see more from Dan & Patricia you can check out: mygalthezombie.com, crazygoodcomics.com, Facebook, Youtube, Instagram (Dan), Twitter (Dan), Instagram (Patricia), Twitter (Patricia). Patricia Krmpotich and Dan Conner sit at their table with Dan's daughter. 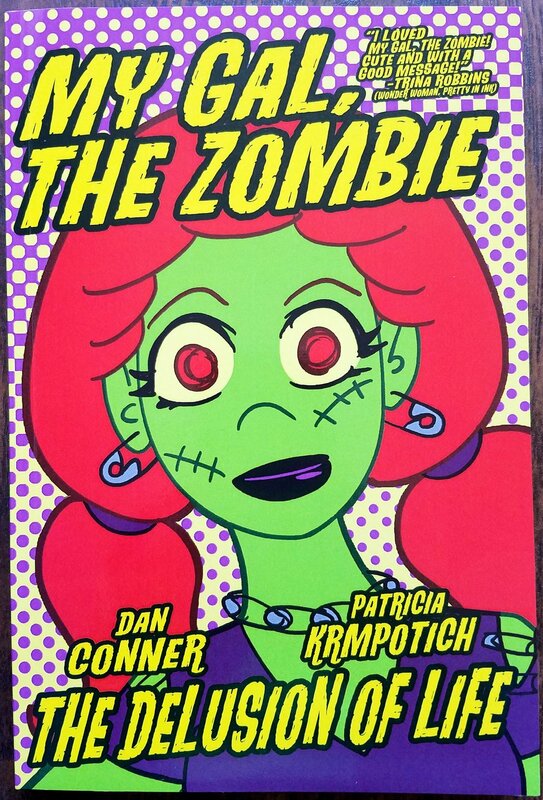 My Gal the Zombie: The Delusional Life - by Dan Conner & Patricia Krmpotich. A page of My Gal the Zombie cards for Valentine's Day. The folks at Game Face Photography and Printing were there with a variety of prints. Their table also featured information and a sign-up sheet for the Monster Rangers (from Steam Crow)! It is great to see the Rangers starting to spread and grow. To see more from Game Face Printing and Photography you can check out: GameFacePP.com, Facebook, Instagram, or Etsy. To see more from the Monster Rangers you can check out: MonsterScouts.com, SteamCrow.com, or Facebook. At the Game Face Photography and Printing table, with the Monster Rangers sign-up. Moriah Hummer had the first three issues of her comic - Flat Track Furies at her table. Her book is about a Roller Derby team, which is something Moriah knows about - she plays with the Denver Roller Dolls. To see more from Moriah you can check out: FlatTrackFuries.com, Twitter, Facebook, or her personal blog. Moriah Hummer and her Flat Track Furies - providing both substanse and style. Flat Track Furies issues #1, #2, & #3 - from Moriah Hummer. Colton Muheim, Andrew Mark, & Terry Schayes were on hand to represent Red Team Go Colorado and - as always - sketches for children were free. With this event taking place in a school, these guys were busy all day. To see more from Red Team Go Colorado you can check out: www.redteamgocolorado.com or their Facebook. Terry Schayes with Colton Muheim at the Red Team Go Colorado table. Andrew Mark drawing free sketches for the kids at the mini-con. The comics of Red Team Go Colorado. Andrew Mark of Red Team Go Colorado dispensing knowledge (and art) to the children. Cryptids & Cogs Volume 2 - from Red Team Go Colorado! Gerhard Kaaihue was set up with copies of his book Elilani: The Art of G. Kaaihue and several prints, stickers, and original art pieces. To see more from G. Kaaihue you can check out: gkaaihue.com, his store, or his Facebook. Gerhard Kaaihue sketching at the mini-con. Falling Deep #1 - from R. Alan Brooks & Gerhard Kaaihue. William DeLuca and his husband Craig "Pepper" DeLuca had a table at the mini-con where they were selling copies of Campfire Stories of Lake KikiPapi - the comic that they create together. They also had a coloring sheet for children (which my son thoroughly enjoyed). To see more from William & Pepper you can check out: Comixology or the Peppercopia Publishing Facebook page. William & Craig "Pepper" DeLuca at the mini-con. Campfire Stories of Lake KikiPapi #1 - written by William DeLuca with art by Craig "Pepper" DeLuca. A coloring sheet featuring the cover to the next issue of Campfire Stories of Lake KikiPapi - art by Craig "Pepper" DeLuca. Lonnie Allen was there with his art and copies of the latest issue of Suspect Press - a Denver magazine where he is the Art Director/Comix Editor. To see more from Lonnie you can check out: lonniemfallen.com or suspectpress.online. Lonnie Allen with the latest issue of Suspect Press. Suspect Press #16, cover by Lonnie Allen. The latest issue, Suspect Press #17. Danielle Hines, Sean Benner, and Jeremy Taveras were all on hand to represent White Stag Productions and Sean's book - West of Oz. To see more from West of Oz you can check out: Twitter or the White Stag Productions Facebook. Danielle Hines, Sean Benner, and Jeremy Taveras at the mini-con. West of Oz #1 - written by Sean Benner with art from Nicholas Winand. Jay Peteranetz was there selling his comics, prints, original art, Magicians Must Die (MMD) cards - a comic book printed on a deck of playing cards. To see more from Jay you can check out: jnoblepeteranetz.com, DeviantArt, Twitter, or Instagram. Jay Peteranetz drawing at the mini-con. Action Lab: Dog of Wonder #6, cover by Jay Peteranetz. Magicians Must Die (MMD) issue #3, art by Jay Peteranetz. Cartoonist and illustrator Ron Ruelle was set up at the mini-con selling collections of his daily comic strip - At The Zü. He also had a whole stack of original art from published strips, and I was lucky enough to get one. To see more from Ron you can check out: www.ronruelle.com or Amazon. Ron Ruelle at the mini-con. Hey Darwin - At The Zü Daily Strips Vol. 1 by Ron Ruelle. Non-Human Resources - At The Zü Daily Strips Vol. 2 by Ron Ruelle. An original At The Zü comic strip from Ron Ruelle. Stan Yan had a table where he was selling copies of his children's book (There's A Zombie in the Basement) and we were able to talk a bit about his upcoming graphic novel - Regret: A Cancer Survivor's Story. He was also printing out custom Pokemon cards for people (an idea he had with his son). To see more from Stan you can check out: zombicatures.com, TheresaZombieintheBasement.com, stanyan.me, or read Regret here. Stan Yan and his wife Erica at the mini-con. There's A Zombie in the Basement - a story book by Stan Yan. Regret: A Cancer Survivor's Story, by Stan Yan. Jacenta Irlanda of Centalynn Artworks was there selling her fine art prints. Her line of Steampunk Robots is awesome. She was cosplaying as Jubalee from the X-Men, which is also awesome. To see more from Jacenta you can check out: Facebook, Instagram, Twitter, or Pinterest. Jacenta Irlanda of Centalynn Artworks. Steve Moore of MacWolf Productions was on hand selling his laser-cut clocks and placards. He had a really impressive display laid out for the show, and it all looked amazing. To see more from MacWolf Productions you can check out: www.macwolfpro.com, Facebook, or Twitter. Steve Moore of MacWolf Productions at the mini-con. A Metroid clock from MacWolf Productions. A Weyland-Yutani Corp placard from MacWolf Productions. Michelle McAveney of Ink Splotch had a table and was selling her comics, prints, stickers, and bookmarks at the mini-con. To see more from Ink Splotch you can check out: her website, smackjeeves, Twitter, Facebook, Patreon, or Storenvy. Michelle McAveney of Ink Splotch. A mini print from Michelle McAveney. Spider Wings Vol.1 by Michelle McAveney. Matt Barclay of Lunch Bag Lab arrived at the mini-con with a plethora of original lunch bag art for sale - and then proceeded to sit down and make a whole bunch more! To see more from Matt you can check out the Lunch Bag Lab Facebook page. Matt Barclay of Lunch Bag Lab at the mini-con. Han & Chewie by Matt Barclay.